I had big aspirations for July's second full moon. I made an effort to set time aside and managed three outings. Once on the waxing moon, once on the full moon itself, and once on the wane. Each was a very different experience. 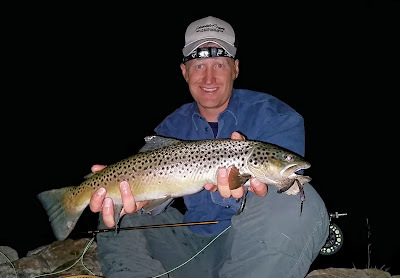 My intention was to target browns on mice, and I spent the bulk of my nighttime hours slinging them. I've been tossing them on a stiffer 5-weight 9-foot rod that I loaded with a weight-forward 6-weight line. I've kept my leaders heavy and around 9 feet. I had some disheartening break-offs earlier in the summer and decided the leader just takes too much abuse in the dark not to go heavy. But, looking back over my summer so far, my best action has been with a lighter leader. Maybe under a bright moon the leader has more visual impact than I might think. But the jury is still out. Those earlier trips were also on darker nights. that night I actually saw a natural mouse get taken. It skittered out from the bank onto a weed mat, then back in. Out and back. Out and back. It was so fast that it took two or three times of going in and out before I realized what I was looking at. Then, on its fateful trip to the outer edge of the weed mat, the water exploded, and there was no return pitter-patter to the shoreline. I roll-casted my mouse onto the spot within the second and swam it along the weedline and over the same place the real one had met its demise moments earlier. But the fish had cruised on. It wouldn't be fair to say we caught nothing. Before the sun went down and we reverted to the mousing-a-lake experiment, we took several fish on jigs - rainbows and few walleye. One beast of a fish hit a beast of a plug right at dusk, but we didn't get to see what it was. Likely it was our one encounter with the brown we were hoping to meet that evening. My last night out was in awesome conditions. A perfectly beautiful, windless 72 degrees. Moonlight like daytime. I hiked along the river where I'd caught my last two biggest mousing browns. I fished 5 or 6 hours without a hit. Yet fish were very active, more so than most nights. Typically you'll hear the occasional fish hit the top. But tonight there was lots of feeding all over the full width of the river. I came to a spot where it was apparent that larger fish were present judging by the consistent heft in the sound of the takes. They were holding in an obvious current seam, its boundaries illuminated by the silvery moonlight's crisp sparkle where the two flow speeds met. After no action on the mouse, I set the fly rod aside and started launching plastic jigs into the seam. 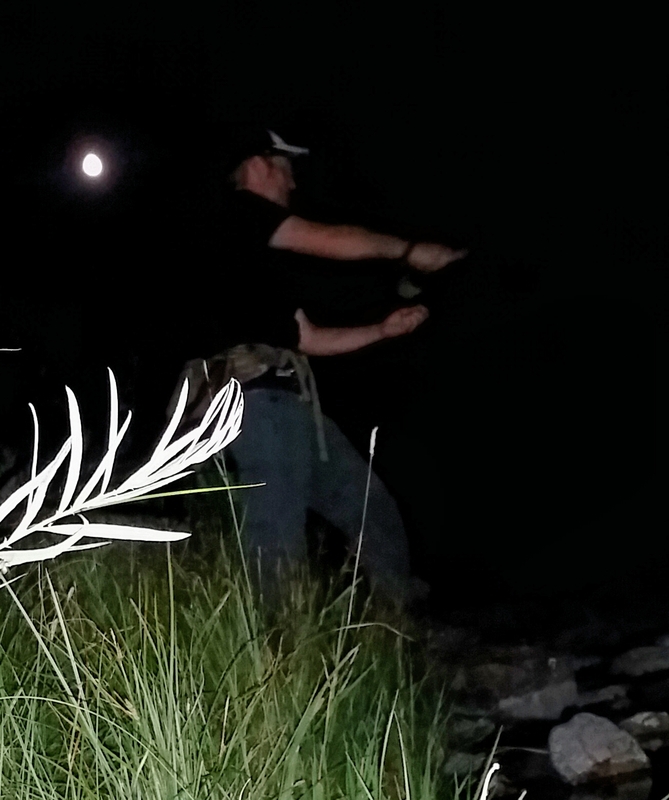 I'd packed along a spinning rod, holstered in the waist pack behind me. I was quickly into fish, and good ones. I landed half a dozen rainbows that were all above the twenty inch mark. Comically, I dropped the biggest one while trying to pose for a snapshot. I don't know what they were taking from the water surface, there was no overwhelming hatch. But they were more than willing to inhale a passing minnow in the moonlight. Big rainbows were definitely active. A couple small walleye came to hand as well. Rejuvenated with some solid fish action I resumed slinging my mouse. Its soft "splat" onto the water seemed too enticing to pass up. But the night ended without one take. I suppose it was only too enticing to me - one more cast, one more cast, one more cast. Still, I suppose the stats are looking pretty good. It was the first night this summer I'd spent mousing on the river without any action at all. Every other trip has resulted in multiple takes, and I go home satisfied if I only get one strike in a night. A brush with a big brown is a thrill. 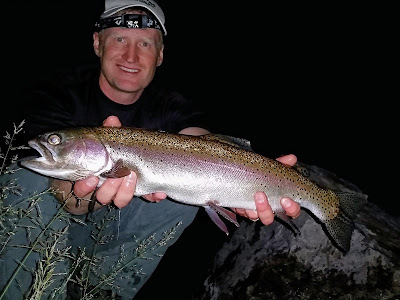 Fishing for them in this manner is like somehow combining the hunt for steelhead with bass tactics. Or does that describe musky fishing? What's not to like! What camera lens magnifies the fish so nicely ? Same cell phone you have!